The Pipestoppers® Division of Huntingdon Fusion Techniques HFT®’s Qwik-Freezer™ Pipe Freezing Equipment uses liquid carbon dioxide (CO2) to freeze stationary water in any chosen sections of pipe or tubing. By producing very low ‘dry ice’ temperatures, Qwik-Freezer™ forms a secure in-line ice plug. This temporarily isolates the water in the system and allows repair or modification to be made without draining or shutting off systems, saving valuable time and preventing large amounts of water waste. The standard Qwik-Freezer™ Systems suit pipe and tube sizes from 3/8” to 8” (10 mm to 200 mm) diameter. 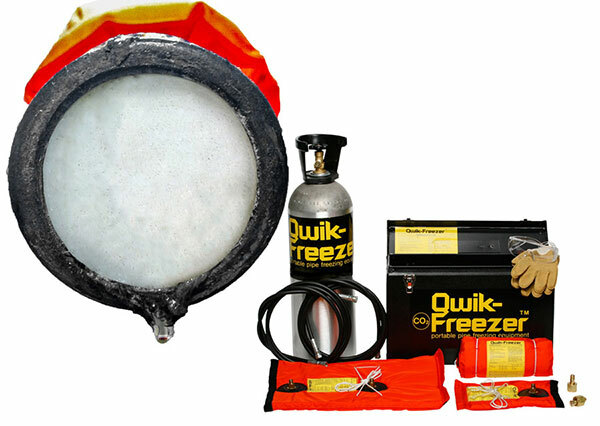 The Qwik-Freezer™ kit is easy to use, A specially designed jacket is wrapped around the pipe where the freeze is required. 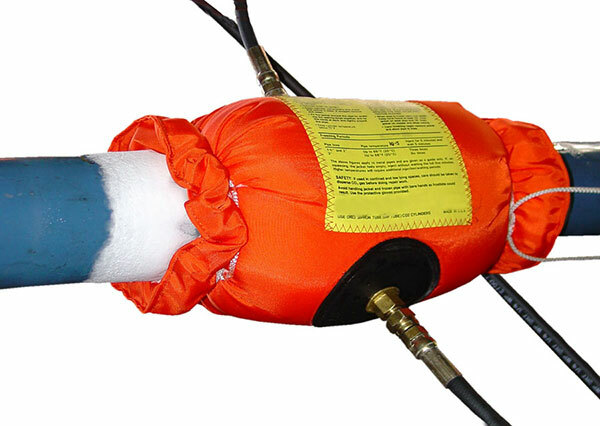 A nozzle on the jacket is then coupled to the cylinder of liquid CO2 by means of a high-pressure hose. When liquid CO2 is injected into the space between the jacket and the pipe, it immediately expands to form a solid carbon dioxide plug (dry ice) at a temperature of -70ºC (-108ºF). This low temperature quickly freezes the water inside the pipe, forming a secure ice plug, which seals in the pipe. Qwik-Freezer™ Systems allow operators to source their own CO2, which is inexpensive. The Qwik-Freezer™ System is desired when pipes carrying water are in need of repair or maintenance. For pipes carrying other liquids, please see our Accu-Freeze™ Systems. A typical Qwik-Freezer™ application: Replacing a defective valve. The water is brought to a static condition. 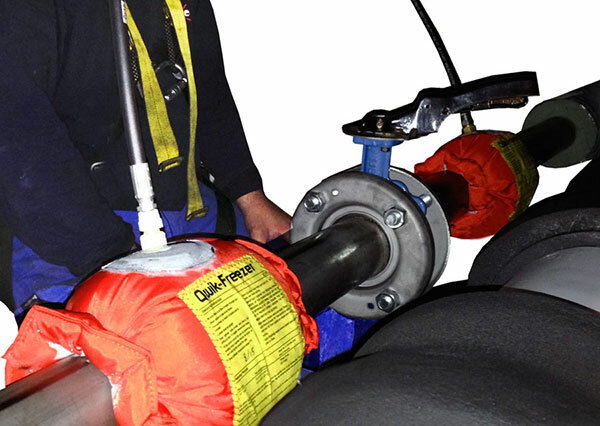 The Qwik-Freezer™ jacket is wrapped around the pipe (at a nearby upstream location). Liquid CO2 is injected into the jacket. The CO2 freezes the water in the pipe, permitting valve removal for servicing or replacement. 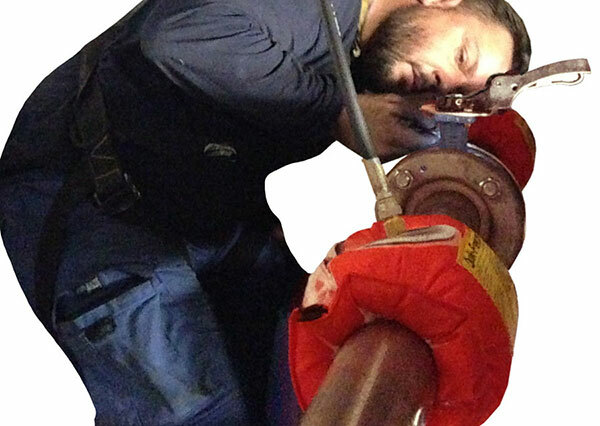 A second jacket can be positioned when a double freeze is required to block the flow on both sides of the valve.